The prognosis of adults with relapsed /refractory (R/R) acute lymphoblastic leukemia (ALL) and non-Hodgkin lymphoma (NHL) is still very poor [1–5]. With the increasing use of next-generation sequencing (NGS) and molecular biomarkers, early diagnosis and targeted therapy become possible [6–10]. It appears that NGS-based minimal residue disease (MRD) monitoring may better predict MRD relapse and lead to earlier intervention . B cell ALL and NHL frequently express CD19, CD20 and CD22 on the cell surfaces. Monoclonal antibodies (MoAb) against CD20 have been widely used for the treatment of multiple lymphoid malignancies [12–14]. Immunotherapy with bispecific antibodies such as blinatumomab against CD19 is being studied in multiple types of B cell malignancies [15–23]. Immune checkpoint inhibitors have also been approved for treatment of Hodgkin lymphoma . Chimeric antigen receptor (CAR) T cells are also being widely studied in clinical trials [25–31]. CD19 is the most commonly targeted surface marker in CAR T trials [32–37]. CD20, CD22, and CD30 are also targeted antigens of CAR T cells in ALL and lymphoma trials . Tisagenlecleucel has been approved for R/R B ALL and diffuse large B cell lymphoma (DLBCL) [36, 38–42]. In addition, axicabtagene ciloleucel has been approved for R/R DLBCL [43, 44]. In addition to the above immunotherapeutic agents, conjugation of cytotoxic agents with monoclonal antibodies is an evolving field with the development of multiple targeted cytotoxic agents called antibody-drug conjugates (ADC) . These are being used and studied with targets across different malignancies (e.g. trastuzumab emtansine in breast cancer, gemtuzumab ozogamicin in acute myeloid leukemia and brentuximab vedotin in Hodgkin lymphoma as well as CD30+ anaplastic large cell lymphoma) [46–52]. Inotuzumab ozogamicin (INO), a CD22 MoAb conjugated with calicheamicin is one of the newest ADCs in clinical application [53, 54]. INO has been approved for treatment of R/R B cell precursor ALL [55–63]. Multiple ongoing trials are evaluating its role in the R/R B cell NHL. 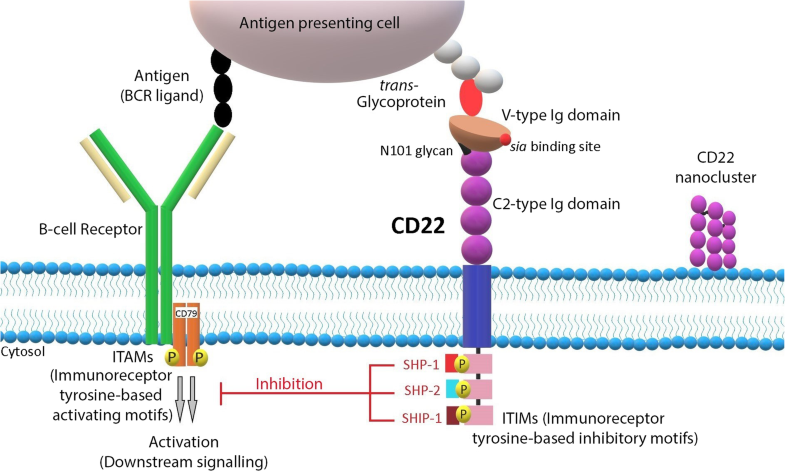 This review summarized recent development in INO applications for B cell ALL and NHL. CD22 is an inhibitory component of the B-cell receptor (BCR) complex expressed exclusively in pre-B, immature and mature B cells but is lost upon differentiation to plasma cells [64–66]. It mediates negative impact on BCR signaling pathway by dephosphorylating the associated cascade components via protein tyrosine phosphatases [67–69] (Fig. 1). VOD as seen with gemtuzumab ozogamicin has been reported with the use of INO in the setting of autologous or allogeneic transplant [55–57, 59, 63, 73, 85]. A retrospective study of 26 patients with refractory ALL received INO followed by AlloSCT. Conditioning regimens consisted of cyclophosphamide, clofarabine, fludarabine, melphalan, thiotepa and total body irradiation . Five patients suffered fatal hepatic VOD at a median of 23 days after SCT. In particular, patients who received conditioning with double-alkylating agents (e.g., high-dose busulfan and cyclophosphamide) may be at especially higher risk of VOD . Splitting INO dosage appears to be useful to minimize VOD [55, 56]. Incorporation of blinatumomab as consolidation in the miniHCVD -INO-blinatumomab regimen increases the time between INO and AlloSCT [55, 56, 59, 81]. This may further decrease the VOD risk.